On July 23, 2015, The Boeing Company, June Boeing and The Museum of Flight partnered to announce a joint $30 million investment to create The Boeing Academy for STEM Learning at The Museum of Flight. They asked The Keller Group to coordinate media and support the creative development of a large-scale launch event. The announcement attracted significant media attention, including front page placement in The Seattle Times, Associated Press stories nationwide and a series of broadcast stories in the Puget Sound region that continued to run throughout the weekend following the announcement. In total, 110 stories – 53 print and 57 broadcasts – ran about the announcement, creating 153,600,133 PR impressions. On the social media front, we inspired conversation from event participants, reporters and community members that resulted in more than 326,941 direct timeline impressions. Beyond media, the event itself included hundreds of kids interested in aerospace and technology, community members and business leaders, all of whom participated in a massive paper airplane toss to formally “launch” the Boeing Academy for STEM Learning. 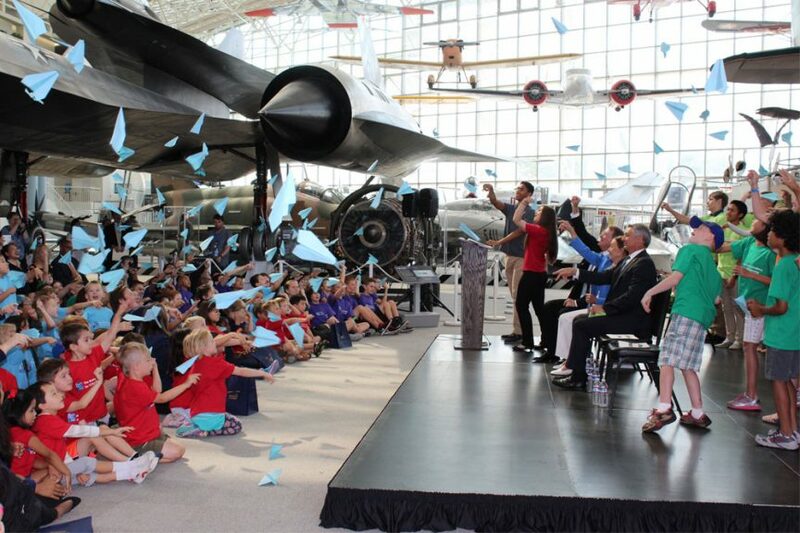 The images of this paper airplane toss were circulated widely on social media and served as a powerful image representing the future of STEM education at The Museum of Flight.